This book exceeded my expectations. I loved the premise and the book didn't disappoint. Imagine a lab that is experimenting with genetics. Imagine one of those genetically modified animals is a purple puppy. I'd love a purple puppy. This lab has created a new set of animals. Two of the dogs have a heightened sense of smell and hearing, not to mention having camouflage colors. You know that if the military is involved that all cannot be good. 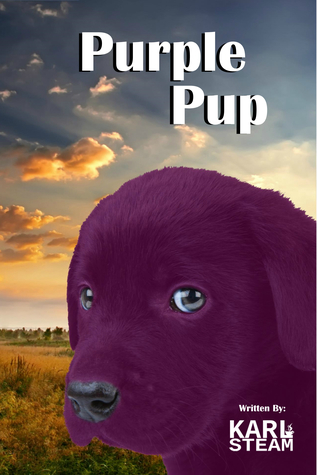 What happens when the purple pup escapes and finds a family that treats him with love? When the purple pup is seen and put on the news things change. He is returned to the lab where he helps several of his friends escape. The adventures this little pup finds keeps you turning the pages. It was a quick read. I sat and read it in about two hours. This is one of those books that make you think how cool it would be to have some of these animals. Then you have to think about how fair it is to the animals. This would be great to read in conjunction with a science unit on genetics. The possibilities for conversations with students about genetically modified things could bring about some great discussions. Not only do I love this book because of educational reasons, but I love it because it is well written and sure to keep young and old alike reading. 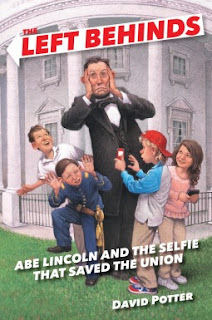 Want a fun way to teach some history? This is the book you must read. Imagine three kids traveling back in time through a phone app. That is what happens to Mel, Brandon and Bev. There is a first book to this series. I will need to read it and add it to my shelves. Don’t let me misguide you with my first statement. This is one of those fun books with just enough history to make kids the inquirers we want them to be. An added bonus is the author notes at the end of the book that five you so much more information. I know my middle school students will love this one because it has history and technology. What a great mix. These three children are left behind at their boarding school and use the app one of their professors invented to escape back in time. They must stop history from being changed. This is such a fun premise. Yes I am a lover of time travel books and a lover of history. What could be better? The only thing that could be better would be reading the first book, and then the next book in this series. This book is a combination of geographical facts and science facts. This will give readers a basic knowledge of our planet. I would even go so far as to say this would be a great resource for classrooms, especially for parents who homeschool. There are many other books in this series. I would recommend you check them out. 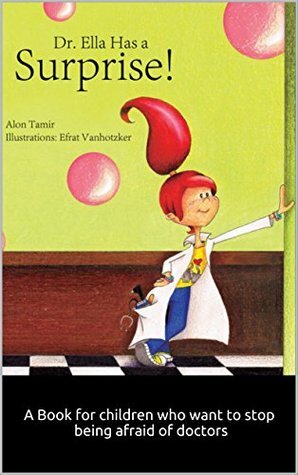 This is a cute book that shows three kids with three ailments. Then we meet Dr. Ella. The repetitive stanzas demonstrate to readers that there is nothing to fear when they go to the doctor. A list of items doctors use helps familiarize children with the doctor’s office. Gracie Lou has a problem. Every night a bad dream monster keeps her awake. She wakes her parents up until one of them sleeps with her or she crawls into their bed. Her dad and mom are tired of getting no sleep. Dad decides to become the Bad Dream Monster Eater. Will his plan work? 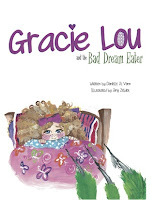 This is a wonderful story to read to children who fear going to bed alone at night. This is a strange story of a friendship between a great Pyrenees dog and a very young skunk. 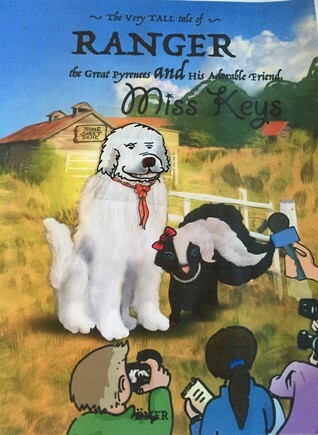 When Miss Keys’ momma skunk goes off to join a circus, she leaves behind her daughter. She and Ranger become great friends and travel all over the place. But, what happens when they become homesick and meet up with Miss Keys’ momma” A cute book that shows no matter how different we are there should be nothing to keep us from being friends. 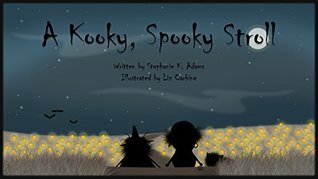 This fun rhyming story follows two young children as they are out at night on Halloween. They walk through many scary things to go trick or treating. Can you figure out how scared they will get? Nola is based on the real rhino named Nola. She was a rare rhino. She was taken to a zoo to protect her because her species was almost all gone. For me, the information from the zoo keeper, and the back of the book, made this a wonderful book. 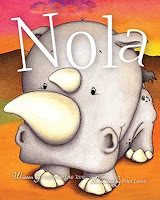 Oh yes, there is also all those cute illustrations of Nola. Ginger is excited for the “autumn snow”. 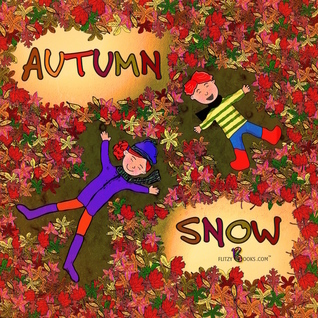 She takes her younger brother Tommy outside to enjoy the autumn snow. I grew up in Indiana on a farm. We had lots of maple trees nut trees. We had a lot of different types of leaves and my sisters and I loved to play in them. I could identify with Ginger. It took me back to my childhood. I live in Florida and the falling leaves is one thing I really miss up north. I loved the way the author incorporated photos into her illustrations a wonderful and heartwarming book.